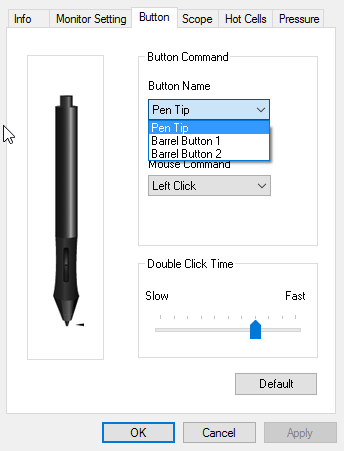 [Archived] Buttons on Huion pen · forums · community | osu! So the way I grip my pen, my fingers are right at the top of the top button on the pen, and when I play, I sometimes accidentally press the buttons on the pen and sometimes (about 1/3 of the time) it will move my cursor to the top of the screen for as long as I hold it messing up my aim. This is becoming a major issue where it messes up would-be FCs or other things. Basically it's very annoying and I was wondering if there was someway to fix this. Thanks in advance. -_- That was so helpful. Don't you think I've already tried to search how to do that? This should resolve your problem. If i misunderstood the problem, please feel free to correct me and i can attempt to help further. You got the problem correct, but the issue is that even though I have the correct pen driver installed, I cannot access the configuration menu at all. There is no EXE for me to run that would open that anywhere, not on the desktop, not on the files, not on the control panel, nowhere. Any ideas? When you installed the HUION drivers, you should've gotten an application called TabletDriver. Run it as an administrator, and try selecting the buttons to "none button"
Works for the battery powered and rechargable pen. I'm having a problem with the latest drivers as of now. I have a dragging play style when it comes to tablet so when I try to drag now it does some long press action and I can't seem to find away to disable it. It was possible in the old drivers to change it so I find it a bit odd to remove it. The only reason I updated my drivers because my old drivers had problems detecting when my pen was in use. Is there anyway to disable it before I go back to try reinstalling my old drivers? Please make a new thread. Do not bump old, marked threads.